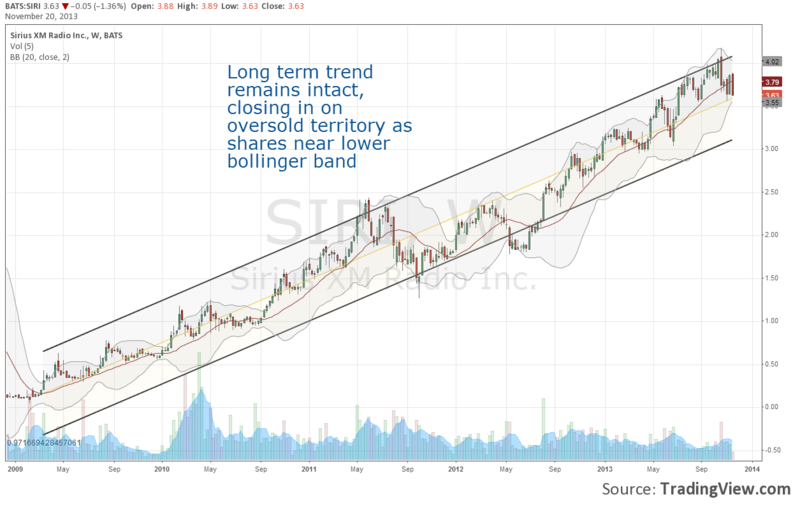 Since late 2008, Sirius XM Radio (SIRI) stock has been one of the market’s best and most consistent performers, with shares up more than 2,500% in the past 5 years. Near at a post-merger high heading into their latest earnings release, expectations were sky-high. Despite reporting very good numbers, showing strong year over year growth and re-affirming their outlook, their stock was sent lower as many investors were disappointed that SIRI didn’t raise guidance. In the subsequent weeks shares have continued to track down, closing today at $3.64. While some may assume their uptrend must be broken considering their recent price action, if you look at their long-term chart it is easy to see that the trend remains very strong still. SIRI was approaching overbought levels prior to earnings, now shares could be considered close to oversold as they near their lower Bollinger Band. Sirius XM has made enormous strides in terms of revenue growth and profitability in the past few years and will generate $915 million in free cash flow this year, money which will be used to fund a $2 billion buyback announced by SIRI last month. With solid fundamentals and future growth prospects, a shareholder friendly management team actively returning capital to investors, and short-term technical support provided by their Bollinger Bands, SIRI is currently at an attractive level for those looking to enter a long-term position. Their uptrend remains very much intact.